Free wireless internet access for your laptop. Buses to Edinburgh pass Ashcroft's gate every half hour. 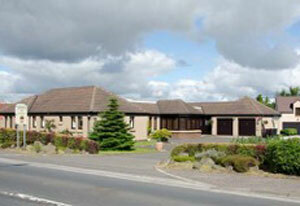 Uphall train station (free parking) is 10 minutes away; Regular trains to Edinburgh and Glasgow. Tram into Edinburgh city centre. £1.50. Free Park & Ride 4 miles away with a 15 minute bus service into the city centre for £1.50 each way. Ashcroft Farmhouse is an excellent friendly and professionally run Bed and Breakfast guest house in East Calder - a village just 10 miles west of Edinburgh City Centre. It is a modern house which has been specially designed and built so that all the guest rooms, including the six en-suite bedrooms are on one level. The rooms are quiet and light and tastefully decorated, and each is named after one of Scotland's championship golf courses. 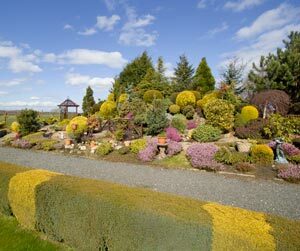 Derek has won an award for the lovely landscaped garden which is much enjoyed and appreciated by visitors to Ashcroft. Elizabeth and Derek Scott offer a very warm welcome and greatly enjoy their guests. 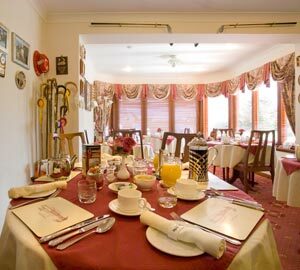 They have been extending the same friendly Scottish hospitality for over 50 years, and, whether on business or for pleasure, their guests return time and again. 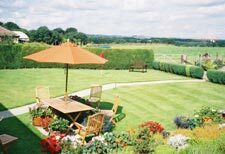 Elizabeth was placed in the top 5 in the AA Landlady of the Year 2004 - out of nearly 4000 establishments, and runner-up AA Landlady of the Year 2005. And 2012 Ashcroft Farm house is placed among the few finalists for AA Friendliest B & B of the year! Guest Lounge with books and flat screen TV. (above). Two family bedrooms (sleeping 3 and 4). Three twin bedrooms (transforming to kingsize doubles with 'zip and link'). 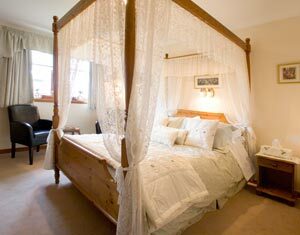 One double bedroom with 4 poster bed. Remote control colour flat screened TV. Hospitality tray with tea, coffee, fruit and green tea selection, Hot Chocolate, chocolates and shortbread! Hair-drier, dressing gown and complimentary toiletries. Derek's delicious home made sausage made to a secret recipe (Derek is a retired Master Butcher). 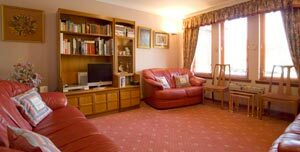 Adults and children over 12 years: £50–£60 per person per night including breakfast. Please note: no children under 12 years of age, sorry. 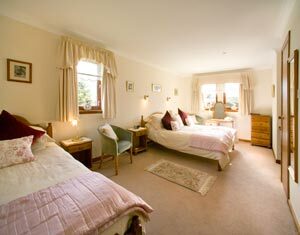 Children aged 12 - 14 years sharing family room with adults are charged £25 per person per night. 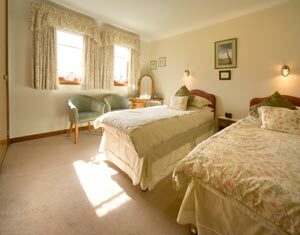 Single occupancy of double or twin room: £60–£65 per night including breakfast. Visa, Mastercard, Switch, Delta accepted. Below right; Part of Derek's award winning garden. Early flowering heathers in March. Please tell Elizabeth and Derek you found Ashcroft through About Scotland!